Wants to get hundreds of likes on facebook? There are many reasons for a man to use these social networking services. Most of us use to find out our forgotten friends. Some like to make private chat with their boyfriend or girlfriend, some people like to play Facebook games, Online marketing and so on. Also there are other types of people who wants to be famous (Atleast on fb: D). For all such people getting likes for their Status, Profile picture, images, Pages etc. But on a serious note,Facebook likes are what you need to benefit from the many benefits of Facebook. They help to boost your page’s popularity. In actual fact, the only way to get the deserved popularity and fame is to increase your facebook likes. But billion dollar question is that how to get so many likes and comments on photos, pages etc.Does it require any hacking knowledge or you need to do be coder? Ans is Absolutely No. So, here are some loop holes and tips to get good amount of Likes for your Facebook pages, Profile Pictures, Status etc. One of the easiest ways to get more likes on your profile picture is to tag your friends. Currently Facebook allows Maximum 50 tags by which you can get likes at ease. You may lost like of your best friend because if he fail to discover when you add a new pic. This can be solved by tagging him in your picture. While tagging, your pic will be on the timeline of victim and visible in his notifications. Even if others comment or like the pic, he will be notified easily and continuously. Finally he surely like that pic. This won’t work fine if your target disabled tagging feature via Facebook Settings. When uploading a new image tag upto 50 and after one or two days remove tagging and tag another 50. Continue this process until you finish tagging your complete friends. If you have 1000 Friends, you will definitely get more than 500 Likes. · What if I don’t like tagging? Common Doubt. If you don’t like tagging all your friends on a single image, there is an alternative method. Yes, if you get bored or really don’t like this annoying thing of tagging every your on list then you can just re-like or re-comment on your profile picture or status again. if you like or comment anything, it will shows as a notification for your friends. That means, while you upload or change a status, it will notified for your friends. Similarly if you make a comment, it also visible. Reply to those had made a comment. Also at end of day unlike your status/Pics that you can do re-like and re-comment again. Now next question comes in mind, so to get likes we need do all this hard work manually every time? There is no value for those website which are offering social credit exchange without enough visitors. More the visitors, more exchange value. There are many websites still providing social exchange without enough traffic. The problem will be for the customers. When someone tries for a social credit exchange, he should need to wait for a long time. But Addmefast is completely different. It’s awesome feature is that there will be more than 1000 k visitors at any moment. So if you have points, you will get points very quickly. Let’s check out how to get facebook likes from Addmefast. #1: Create an account on Add Me Fast. Want to lose money, start liking, sharing, viewing others stuffs. 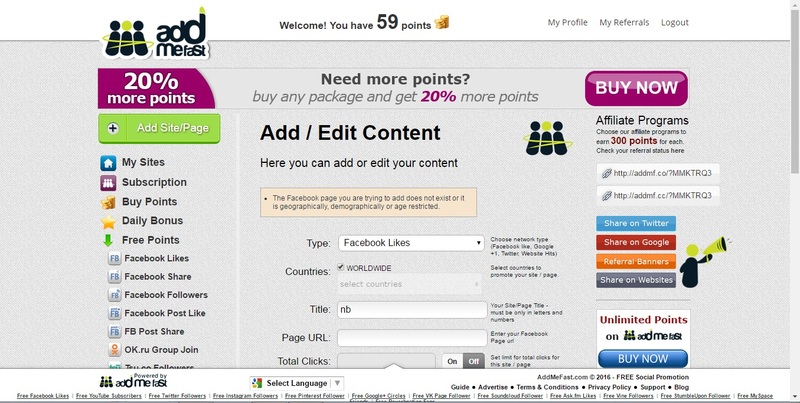 #3: After you earn some points, click on Add Site/Page button. #5: After filling details, click save button. 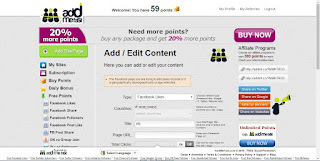 Now you can see that your Page/photo getting likes quickly until your gained points finishes or till the desired limit. 1. It is better to give points not less than 7. If you give 10 points, it will have more priority than lower points. 2. 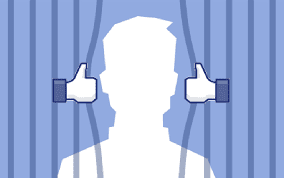 If you are not purchasing credits, it would better to create a fake Facebook account and start liking others pages/ photos. Otherwise it will annoy your friends. Add me fast also provides points for Daily Login and for referring friends. Like Addmefast There are many more site which can be used to get more and more likes on facebook.Listed down some them based on reviews found on Google. Use any of these sites as per your comfort and start getting likes.. and Be Hero. There are more many Autoliker sites which you can try. Your welcome.keep reading and encouraging..
Thanks.Keep following and keep sharing. I did not even think before coming here that I could read such a great topic. How can a person communicate so nicely? I want to come here again because I do not want to miss such a good post. There is nothing to say.